They were covered in red. I started frantically pulling other items out the dryer. Red. Red. Red. Everything had red on it. I started freaking out searching for a lone lipstick tube or anything else that could have caused such a disaster. I couldn’t find anything! I was completely stumped when suddenly I could see in my mind’s eye a scene that played out earlier that day. While vacuuming my boy’s room I reached down and picked up a red crayon and stuck it in the back pocket of my jeans, that I then threw into the washing machine without checking the pockets. UGH! I threw that load of laundry in my room, so angry that most of my son’s brand new school clothes were ruined and left for my date. Two days later I remembered that I needed to do something about the pile of red stained clothes and googled, “how to get melted crayon out of clothes.” I found some results, but I was skeptical and didn’t think it would work. I knew it was worth a shot though, so I laundered the clothes and just like magic the evil red stains disappeared! I was so amazed. Here are a few before and after photos. The only reason the colors look different in the photos is because the first ones were taken with a flash at night and the second photos were no flash during the day. 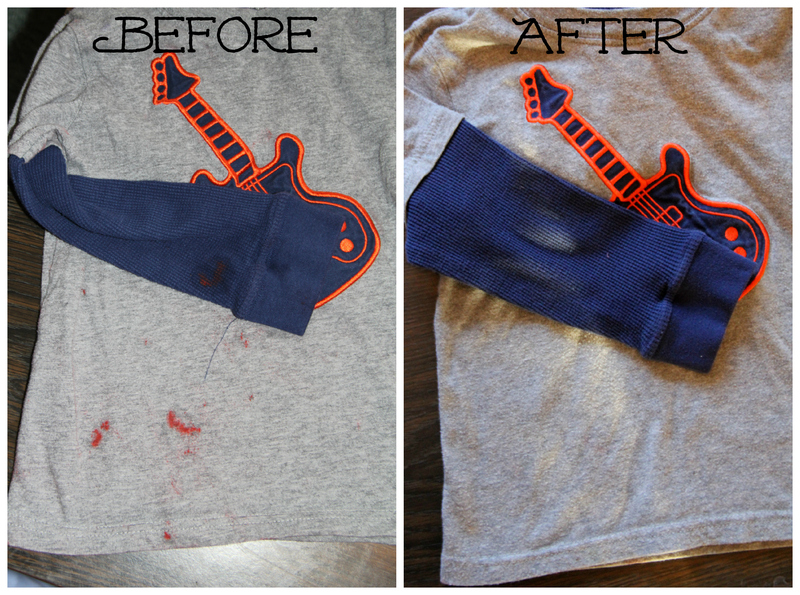 The red came out of most t-shirts, jeans, khakis, and socks, but it didn’t work on one of my husband’s work shirts. The shirt was slightly textured so it really soaked up that crayon wax and it wouldn’t come out, but really that shirt was a beast to iron and I secretly was plotting its demise anyway (I think I’ll turn it into this). It also didn’t come out of the bands on my boys’ underwear, but I’m totally fine with stained underwear bands (there’s gotta be a good joke here, but I can’t think of one). So, this might not work for everything in a ruined load of laundry, but it’s worth a shot! Set washer to sanitize cycle and load clothes. Pour 1/2 white vinegar over the clothes. Add four tablespoons of Dawn dish soap to the clothes. Add detergent. Use whatever you normally use. Don’t forget to clean the drum of your dryer so you don’t stain any other clothes. 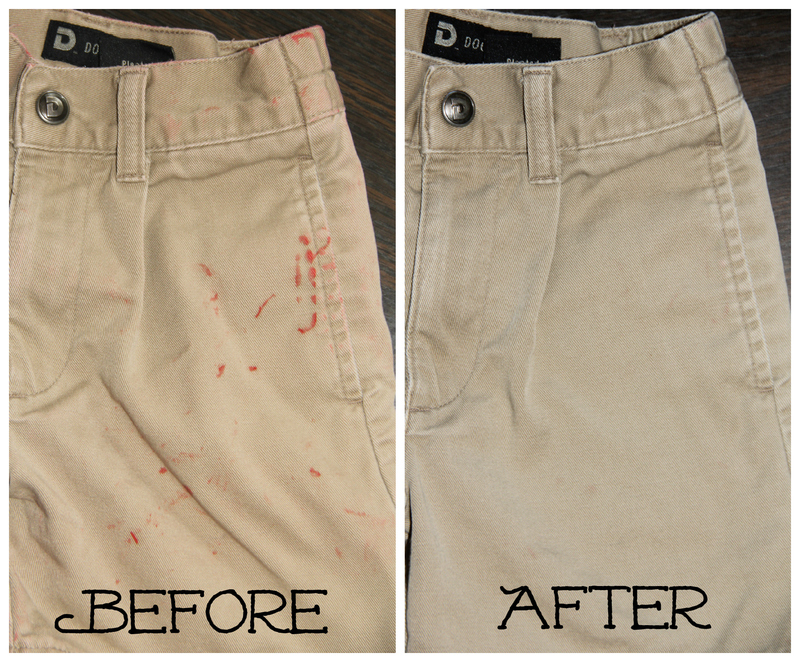 I used a magic eraser and it worked great removing all the red crayon. I have read hundreds of posts that this solution will work….it is not working for me and I am very distraught. My three kids start school tomorrow and I washed ALL of their uniform shirts tonight in prep for school tomorrow and ALL of them have red crayon on them (white and light blue oxfords and polos). I am on my second attempt repeating the boiling water, soak 15 min, extra dawn, extra vinegar, laundry detergent and wash cycle. I am not optimistic and have about 16 shirts that I probably have to replace at this point. Any idea why this isnt working for me? I am willing to try anything at this point..replacing all these uniform shirts will be incredibly expensive. This worked so well! My three year old “helped” Mommy put the laundry into the dryer today, and in doing so left a blue crayon in the dryer. Surprise!!! Used this method in my front load washer by pouring the soap, vinegar and boiling water into my washing machiene’s soap dispenser. Voila! Y’all are absolutely BRILLIANT!!! My 15 year old was doing her own laundry and she threw in her 8 yr old sister’s jacket in the wash. Little did we know the 8 yr old had blue and yellow crayons in her pocket!!! Ughhh!!! We followed your simple steps and amazingly ALL of the crayon came out….and there was a lot of it!!! OMG you saved my life and laundry!!! I followed your instructions (added 1 full cup of vinegar) and all but 1 of my items has been cleared of blue crayon. The only item that didn’t fully clean was the pair of footed pjs my daughter had hidden the crayon in…but hey not too bad! Thank you thank you thank you! !